Referral is a powerful way of acquiring new, paying customers (in fact, it’s more effective than both digital advertising and social marketing). But, when your product’s more of a considered purchase, it’s also the best way to grow your list of potential customers so you can gradually tip them closer towards converting over time. 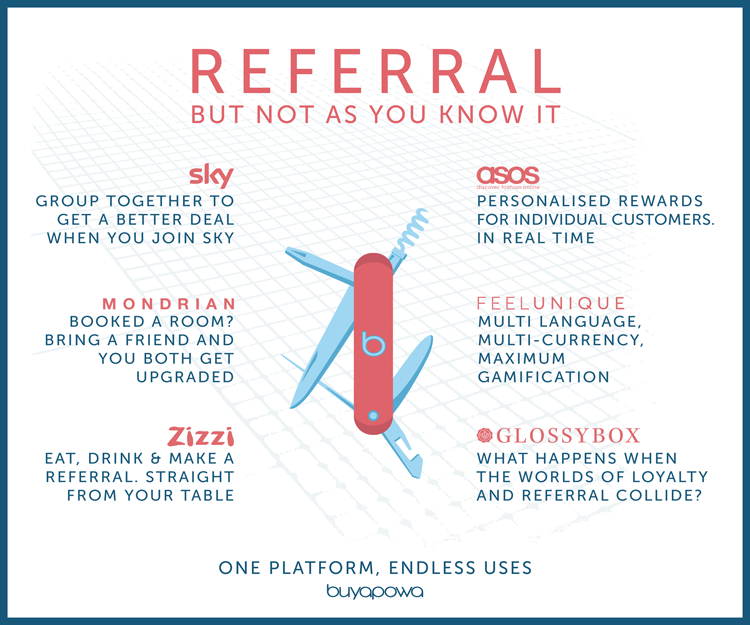 Leading brands like Sky are using the Buyapowa platform to do exactly that: getting existing customers and prospects to introduce their friends – if enough of them sign up, everyone benefits from a great offer. Every business is different, and every business has its own challenges. The hospitality sector, for example, tends to be bound by legacy technology – especially when it comes to hotel bookings, which are often processed manually. That makes common-or-garden digital referral programmes impossible, even at state-of-the-art, super-modern hotels like the 5-star Mondrian London… until now. Thanks to the unrivalled flexibility of the Buyapowa platform, we enable referrals to be processed and tracked in countless ways – even entirely offline – ensuring that no business, brand or retailer ever has to miss out on this essential tool. As e-commerce goes from strength to strength, it’s sometimes easy to forget that most brands’ and retailers’ strongest touchpoint with their customers continues to be in-store (or, in Zizzi’s case, in their 140 restaurants nationwide). That’s why the Buyapowa platform gives our clients numerous ways to engage their customers in real life and get them to introduce their friends who, in turn, are able to shop either online or at a physical location. Everyone talks about multi-channel; we’re actually doing it. Existing customers, lapsed customers or new customers: many of our clients are happy to reward referred-in shoppers no matter whether they’ve seen them before. Others are very focussed on one of those groups – usually new acquisitions – and tailor their referral programmes to fit those goals. But some of our most sophisticated clients, including ASOS, use our live API to augment their single customer view in real-time, serving back tailored experiences for every visitor clicking through from an invite. It’s an incredibly powerful tool that’s exclusive to Buyapowa, letting them control exactly who gets what, while making sure that everyone gets to take part. Many of our clients take advantage of the Buyapowa platform’s unique gamification features to get their biggest advocates competing against each other to earn a top prize, referring not just one friend but dozens of friends each in the process. Feelunique, Europe’s biggest online beauty retailer, took that even further with their recent Friendship Day campaign, surfing the buzz around the internet’s celebration of chumminess and focusing a gamification campaign down to a crazily-successful short window of time. Referral isn’t just a great way to acquire new customers; it’s also one of the best ways to get your existing customers spending more and shopping more often – an average of 37% more and 32% more often, in fact. (The reason why makes perfect sense when you think about it: if you go around telling your friends how much you love Chocolate Hob Nobs, it would be pretty weird if you served them Jaffa Cakes when they popped round for tea.) So, it’s no wonder that clients such as GLOSSYBOX are weaving their referral programmes into their loyalty schemes, rewarding existing customers with points whenever they get their friends shopping. These are just a few examples of what some of our cutting-edge clients are doing with the Buyapowa platform. If customer acquisition for your brand requires so much more than just simple cookie-cutter referrals, then we would love to chat with you, so just drop us a line and we can discuss how we can we help you.